Marc Pascal had the good fortune to be raised by a nurturing mother that encouraged his creative gift. At university, he studied Fine Arts (Victorian College of Arts) and returned ten years later to pursue a degree in Industrial Design (Royal Melbourne Institute of Technology). He gathered industry experience designing commercial lighting for a well-regarded Australian manufacturer before establishing his own practice in 1994. 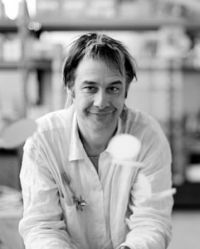 Pascal spent a number of years sharing his talent with students as a lecturer in both Industrial and Applied Design at RMIT. Today he is at a place in his career where he has the freedom and opportunity to explore many interests. He now divides his time experimenting with new techniques and materials, collaborating with various artists, launching new ideas for his product range and working on private commissions. In his Melbourne studio, Pascal combines a wide variety of techniques – laser cutting, metal spinning, swaging and folding, dye cutting, anodising, powder-coating, wood turning, blow moulding and lead crystal casting – he is able to create an unparalleled aesthetic. He is a multifaceted artist equipped with the design ability to bring his beautiful concepts to life. Aptly new ideas and products are introduced to the public through both gallery exhibitions and commercial trade fairs.